Help your managers help your new hires succeed, with a little nudge! "time to become fully effective" to weeks instead of months. Managers play a huge role in their employees' success. This is often most evident, and most important, during the new-hire onboarding process. Google did an experiment where they sent "nudges" to managers before a new hire started. They learned that sending managers a reminder at the right time with simple, relevant information can help improve their new hires' time to productivity and effectiveness. 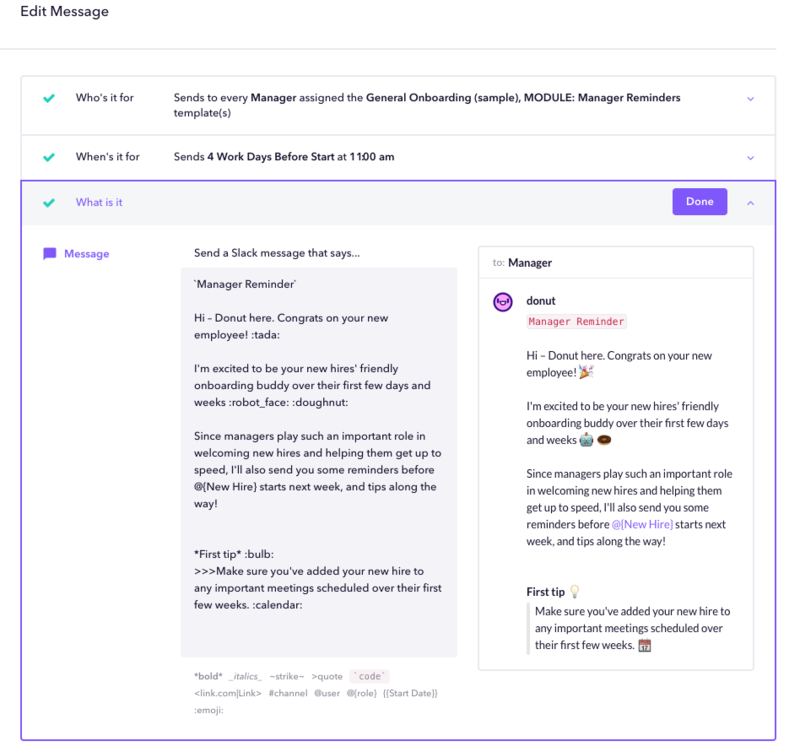 Donut can automatically send messages or tasks to managers prior to a new hire starting, reminding them that they have a team member starting and anything else they need to know. Want to add manager reminders to your Template? Lucky for you, we've included some examples in the General Onboarding (sample) Template on donut.ai that you can use and easily transfer over to your own Template by following the steps below. From the Onboarding Templates page on donut.ai, you can select "General Onboarding (sample)" to view all of the example Messages we've set up. Look for the Messages that say "manager" at the top — these are the Messages for the manager. For example, 4 days before the start date you should see a Message that reminds managers they have a new hire starting, and another Message 1 day before the start date. Click into any of the Messages to view the full message. You can also edit it from here by clicking into the purple text box (on the left). Make any changes you'd like, or just use it as it is — either way, we won't judge! Once you're settled on the message, click on the "Who's it for" section up above and select the Template(s) you'd like to add it to. Then hit "Save Message" and you're all set! For example, if you've created a new Template called "Sales" for the new hires on your sales team, and you'd like every new hire's manager to get these reminders, you can select "Manager" as the role and the "Sales Template." 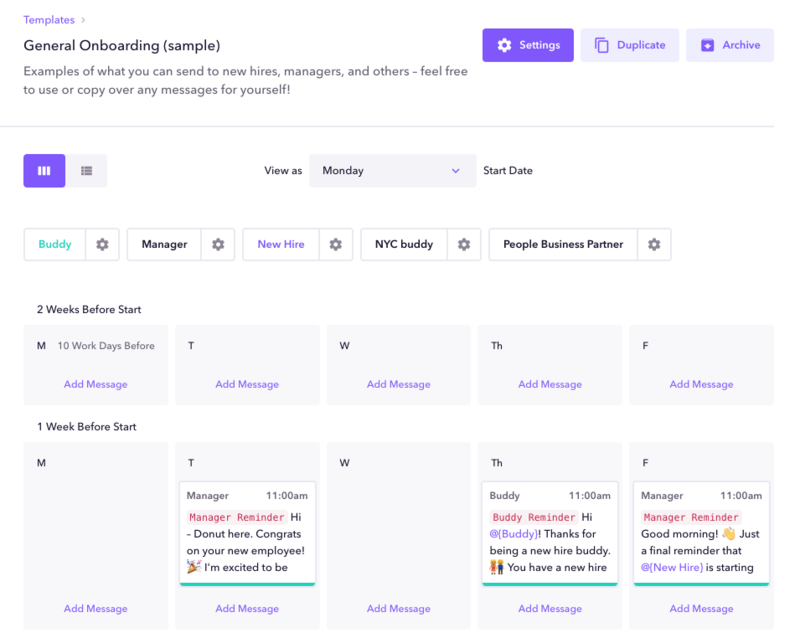 Once you've selected the Template, hit "Save Message" and you're set — all the Managers in your Sales Template will get the reminders. "General (sample)" should already be selected. A Message can be part of more than one Template, so you can leave it on "General (sample)" as well, or remove it by deselecting that Template. Pro tip: You can also create manager reminders from scratch by clicking "Add Message" in the calendar Template view, creating a new Message, and assigning it to the Manager Role!